coaching by coaches trained in the sport-specific National Coaching Certification Program (NCCP) and who have completed a Level 3 Police Vulnerable Sector Check (PVSC). Program Description: Young skiers accomplish ski skills through play and discovery in a positive and safe environment. The focus is on fun, while children develop gross motor skills such as balance, gliding, and diagonal stride without poles. Playtime on skis in addition to weekly sessions is encouraged. The Bunnyrabbit program is designed for children aged 4-6 years. Most children will participate in Bunnyrabbits for two years. Classic skis and boots are required to participate. Poles are optional and are generally not recommended during classes. 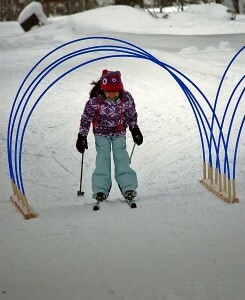 Waxless skis are appropriate for the Bunnyrabbit Program. Upon graduation from the Bunnyrabbit Program, skiers will have developed basic diagonal stride technique and progress to the Jackrabbit Program.